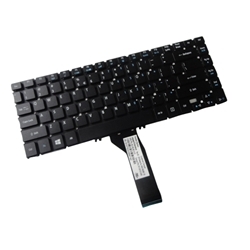 Description: New original Acer Aspire ultrabook black replacement keyboard. This genuine notebook keyboard includes the ribbon cable and is black in color. Part #'s: NK.I1417.0CA, 9Z.N9LBC.A1D, NSK-R5ABC 1D, PK130YO1A00. Acer Aspire R7-571, R7-571G, R7-572.